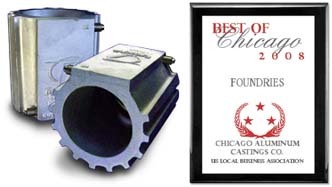 ﻿ Chicago Aluminum Castings Company, Inc.
Chicago Aluminum Castings Company, Inc. is an aluminum sand casting specialist, providing molding inserts and serving industries across the nation since 1910. We work with many aluminum alloys. We are fully equipped to provide engineering services, prototypes, and production runs up to 120 lbs. net casting weight. 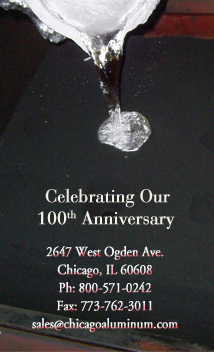 Copyright ©2009 Chicago Aluminum Casting Co., Inc. All rights reserved.